Don’t sit idly and let life happen to you. Get off the couch. Put on your shoes. Pick up your keys and take the driver’s seat. It’s time to grab those recent developments and run with them. After all the tumult of the past month, the skies are extending the invitation and incentive to engage consciously with the ongoing growth imperative, instead of being batted about like the toy of some relentless cosmic cat. The process begins, as always, internally and continues externally. You know what just ended, who left, what broke, what started falling into place and what morphed into wondrous new directions. Processing all that occupies your attention and subconscious this week, but not uncomfortably so. You’re on board (or at peace) with much that’s happened. You’re ready to move on with the good developments; as for the not-so-good ones, well, see if you aren’t relegating them more and more in the past. Friday brings the first inkling of the sea change coming this summer, when a succession of bodies complete a circuit of free-flowing energy called a grand trine with Saturn (structure and the status quo) and Neptune (illusion, transcendence and higher love). The eruptions, seismic shifts, wrecking balls and rollercoasters of April and May are giving way to rushing water of every imaginable kind — feelings, movement, developments and likely rain, rivers, lakes and oceans. His switchover into Cancer won’t be as absolute as in some years, at least at first, until the grand trine kicks in next week. On the same day Mercury moves into Cancer, action planet Mars grabs the baton as if in a relay race and moves into the sign Mercury has just left, Gemini. This hand-off will put a mental cast onto our drive, ambition and modes of expressing energy. He’ll be keeping our minds active, scheming ways to respond to, capitalize on and implement all the recent shifts. Gather data, work with it, and then let the currents lead you. span style=”font-size:medium;”>More’s in my extended weekly forecast, which includes day to day analyses. For another take on this week’s events, listen to my quickie podcast. We’re made it through a month-plus of relentless upheaval and are starting to see the point. We’re changed permanently, and so have our world and the way we view it. Now for the clean-up: As this gauntlet comes to a close, information is rushing in and causing all manner of inner and outer situations to shut down, shift gear or move into new formats. This week’s Sagittarius Full Moon is the last intense astrological event of the spring and the end of the line for the eclipses that have been with us since late 2010. The Gemini/Sagittarius eclipses deal with the power of the mind: how what we think, say and believe filters, limits, molds and, dare I say, creates what happens in our lives. Frames of reference, life philosophies and inner chat have been up for revisiting — especially lately, when so much has fallen apart or morphed that was previously a given. We’re wrapping up that reevaluation now, closing doors, ending chapters, letting go and embracing the new and improved. Full Moons always bring matters to a point of harvest or culmination. Lunar eclipses escalate and enlarge the summing up (not to mention emotions related to them) and throw in huge doses of revelations. All those characteristics swell to the nth degree when the eclipse is ruled by bigger-is-better Jupiter. This week’s is even more outrageously grandscale, since it comes on the heels of the rip-’em-up, tear-’em-down, freedom-and-revolution-at-all-costs imperative of the latest Uranus/Pluto square. Hasn’t all the recent turmoil given you a better understanding of yourself, what you want and what you won’t tolerate? Isn’t your reaction more immediate, more instinctive and more efficient? Think back to 2010 (ancient history, doesn’t it feel like now?) What occupied your mind then? What information channels and technology did you use? What did you believe about yourself, specific people or types of relationships, your prospects and goals, political issues and how the world works? What of that is still true? Don’t you know yourself better now? Divine guidance may lead you there; the dictates of your own heart also hold a key. That’s because Venus is a player in this eclipse. She’s conjunct the Sun’s ruler, Mercury, uniting heart and mind. You know what you want; you know what you value; and the overriding imperative is love. Love and knowledge of yourself is the foundation for everything that spools out from the graduation exercise that is this eclipse. The more clearly you know and value yourself, the more that perspective brings your environment into stark relief. Whatever doesn’t belong stands out so obviously that it can’t be ignored and, increasingly, so insistently that you can’t put up with it any longer. How many friendships and connections have changed for you? How many have ended in mid-conversation, as the other person revealed differing concepts of integrity, responsibility, or how people should be treated (particularly you)? How many longtime activities have you walked into and realized you’d outgrown them? Resuscitating is not possible. We’ve all got a finger on the ejector button. We’ve all got a hand on the lever for the guillotine. It’s not all goodbyes, of course. Some of what you’re seeing in your environment is absolutely, perfectly right. You may be experiencing a new-found appreciation for people and situations that have long been with you. You may hit on ideas for upgrades that would suit you even better. (Technology, software and vehicles are likely candidates; so are beliefs about your worth.) You could even have a religious experience and suddenly see the answer to a prayer standing right in front of you. You just had to update your frame of reference to be able to recognize it. This Full Moon is escalating the role that our beliefs play in our experience of reality, and the role that external sources (the media, the educational system, the legal system) play in creating and directing those beliefs. The Moon’s ruler is Jupiter, the guy who ups any action he contacts. He’s pumping up the Full Moon’s developments so they stretch their limits (and our credulity), making situations so extreme they look like something out of a cartoon. There is no incentive to hold back, to moderate thoughts and words, to realize, in the moment of disclosure, the extent of what you’re saying. Sound scary? Here’s the benefit. This is an extraordinarily revealing time. Backstories are coming out. So are people’s frames of reference, prejudices, and other aspects of upbringing and experience that color their view of reality. Resist the natural human impulse to assume that your position is Truth and the only correct one (whether it’s about your memory of an event or view on legislation), and “Aha!” moments will abound. You can learn a lot – about yourself as well as about the people in your life and on this planet. And about the past, too. There is enormous potential now to move beyond a lot of the revelations – to bring them out of the shadows, to think about them consciously and to reclassify the role, if any, we allow them to play. We are being shown the logical consequences of the beliefs we hold (about life, about ourselves, about people, about everything). Take down your filters. Give them a good scrub and power wash. Replace ones that are ripped or bent. You’ve been doing this unconsciously. Pay conscious attention to the process now. Remember: form follows thought. What we think and say leads directly to what we experience. Even more basically, words, thoughts and beliefs carry energy. That’s fundamentally what the cycle that is ending has been about. You are making choices about the quality of energy you want to experience in your mind, in your heart and in your life. Love plays a role in that quality. You will soon see how beneficial these choices can be. Jupiter, the Full Moon’s ruler and a force of expansion, crosses the Sun’s ruler Mercury on Monday the 27th and Venus on the 28th. Talk and reach out and connect. Let your heart speak. The wild ride is hitting a peak at last. Discomfort may remain, but now the reason or point of it is beginning to make sense. Tectonic shifts are locking into place. Upheaval and restructuring are settling into recognizable contours. Report cards are coming in on matters that have been calling for a reboot since the end of 2010. Two monumental, long-fuse processes are culminating this week: the third of seven action-demanding clashes between cosmic change agents Uranus and Pluto, and the Sagittarius Full Moon, which is the third of this spring’s cluster of eclipses and the last in the Gemini/Sagittarius cycle. Uranus and Pluto are fomenting radical change (heavy on brash individualism) and sending shockwaves through shaky structures and foundations. Their insistence on r/evolution has been hammering at specific areas of and issues in your life for the past year, so you should have more than an inkling of what’s in play. 3. Accepting all the rubble that’s been dug up and piled around us (think: Mike Mulligan and His Steam Shovel) and starting to deal with it. Opportunities will open up now for implementing some of the plans you’ve devised. Taking steps is more important than the end goal. More fine-tuning and surprises are in store. Uranus goes retrograde in the middle of July and will return to the place of the square in mid-September and March. Each time he passes it he will lob lightning bolts that tilt our perspective, break chains and unleash the unexpected. Normally, the Gemini/Sagittarius axis is intellectual and philosophical. It deals with words and the systems of thought we build from them (laws, religions, education). Those words and philosophical systems can and do pack a powerful emotional wallop, as this week demonstrates. Watch for grandiose displays. The emotions this Jupiter-ruled eclipse lets loose — and the revelations it pours out — will hit heights and depths we rarely visit. Since the first eclipse in this cycle, in December 2010, we’ve been coming up against how our words and thoughts create not only the filters through which we view the world, but also our very experience of life. Frames of reference, life philosophies and inner chat have been up for revisiting. We’re wrapping up that reevaluation now, closing doors, ending chapters, letting go and embracing the new and improved. The build-up to this event escalates from the start of the week, as soon as the Sun enters Gemini on Monday. Read more about the eclipse in my mooncast, which will be posted by Thursday. With the square and the eclipse falling so close together, breakdowns and overhauls will abound in Gemini/Sagittarius delivery systems. This means road work and detours. It means technology, software and vehicles hitting the wall (and, perhaps, human sanity with it) and requiring repair, upgrade and replacing. It means the media, courts, legislatures and prejudice reaching illogical and unsupportable extremes. To find stable patches of ground as you walk through this, periodically unhook from your environment. Disengage from the panic, the terror, the insanity, the focus on trivialities, other people’s agendas (even positive ones). Empty yourself, stabilize and check in with your own guidance system. For refreshers on this, listen to my talk Navigating the Shift with Ease and read the tips in my discussion of the 2011 Gemini Solar Eclipse. If you do not have my Internal Guidance System visualization, get it here. The wild ride continues. It’s bringing more revelations, discoveries, revisiting and rethinking the past, and watching foundations crack and reshape under and around us. Yes, more of the same we’ve been experiencing, only even more of it. All of it is building up to monumental activity that is peaking next week. The intensity ramp-up starts on Wednesday, when two moves occur that point to next week. One of them has high potential to add some ease to the ongoing upheaval; the other quickens the ongoing r/evolution. Talk and movement both lighten and speed up when Mercury, ruler of gab, gadgets and getting around, moves into his airy base of Gemini. He is most nimble and comfortable here, where he can flit and flit and multi-task and play while he’s at it. Watch for the change in atmosphere: Talk becomes less ponderous, less weighted by practicalities, more free-flying. The timing of his sign change is important for two reasons. Mercury makes this shift, as so many other planets have this year, during a void of course Moon, underscoring that the inner experience is more important than the outer. He’s also moving into Gemini a week before the last of the Gemini/Sagittarius eclipses we’ve been in since December 2010. With him in this sign, we have the opportunity to gather data about the eclipses — in advance of the final one, and through the rest of the month. Be alert for information about how your thoughts affect what happens in your life. That’s one of the Gemini/Sagittarius eclipse themes. (Read more here about them, and how to use them.) Also look at how your approach to communication, information and life itself has changed since December 2010. And if your thoughts go all over the map, well, they’re supposed to. Wednesday’s second big move is Uranus entering the degree of his square to Pluto. These two titans are responsible for the relentless upheaval (and collective nervous breakdown) of the past year. The cosmic change agents are traveling through 2015 in an aspect that demands action, and next Monday is one of the two times this year their link will be absolutely exact. The tensest part is between this Wednesday and next Monday. Some players and events may be newcomers, but the general issues are oldies. The shockwaves are targeting areas of your life that have already been worked over; we lived through two squares last June and September. Developments are inevitable in the dramas that have been playing out in those areas. Can’t identify them? Use this: What huge remodeling projects started then, intentionally or otherwise? Because Pluto is retrograde, this round of the square has an Empire Strikes Back streak, with the status quo trying to reclaim order and control. Work the two shifts together. When a situation creaks or fractures or breaks open (some of this is positive, you know), let your mind rove. Explore ramifications, possibilities, alternatives. Calling all human sponges! Join me Sunday, May 12 at 9 PM EDT for a phone conference call with simple tools for disengaging and clearing your energy. Survival Skills for Empaths, $20; register here. No matter how crazy events are these days, our focus comes back to basic, simple matters: My turf. My money. My toys. My stuff. My desires. My — admit it — appetites. No one has the luxury of pondering lofty ideals. Who has the time? That’s so tight now that my friends and I have been joking about having to forego sleep to meet deadlines. So much boils down to time, money and resources — how much we have, how much we can give, how much we can get. We’re deeply in a sensory experience of life, very definitely in the here and now. And yet, with all we have, we want more. It’s as if we’ve all been implanted with an entitlement gene that’s pushing us unapologetically toward satisfaction, toward seconds, toward gratification, toward consumption so far beyond the immediate need that no doubt remains we’re full. Thanks for that goes to the Taurus emphasis in the sky (which is affecting desire, drive, mission, communication and general getting around). This week’s succession of super-conjunctions starts with a huge dose of walking our talk in fundamental, practical ways (Mercury and Mars, Tuesday and Wednesday — and don’t be surprised if normally tactically evasive folks are touching your arm or shoulder during conversations). Thursday is a groaning table of emotional assertiveness, brass tacks talk, and giving over to the impulses of the flesh (the Moon and Mars, the Moon and Mercury, the Moon and the Sun). Saturday, Mercury and the Sun bring our thoughts about ourselves to time present (“Do I really look like that? Really?”) and encourage us to get in our bodies. We are not gravitating toward fleeting pleasures, though we may not be conscious of their lasting impact. What we savor now could be with us for (or at least, affect) months, if not years. That’s because all this wanting and pursuing and is answering the call of Thursday’s Taurus New Moon, which is a solar eclipse. Even though new beginnings and phases are the hallmark of this supersized new moon, there are elements of purging and release. The temporary blocking of the light hits a symbolic restart button. In the process of the reboot, people and situations have a way of slipping out. Since Taurus is the playing field, the departures could have once been useful or costly. (Practical objects going lost is another manifestation.) Another reason for the ending vibe these days is this New Moon’s proximity to the South Node, which represents what we are moving away from. Possessions, values, attitudes about love and money — all are being reset, and some are clearing out, leaving room to grow for the ones that stay and the ones to come. Read more about the eclipse in my mooncast, which will be posted by Friday. As much as we have, claim, embrace and consume, by the weekend, we don’t merely want more. We want choices. We want to keep doors and options open. Venus, ruler of all we desire and value, is moving into the air sign of the twins, Gemini, on Thursday. She encourages a lively social atmosphere, flitting from shiny object to shiny object and keeping connections light and fun. While she prefers playing the field, the guests in her Taurus home argue for the reassurance of physical contact and proof that someone is solidly, physically present for you — hand-holding, hugs and the entanglements of the heart that come from more. We’re in bodies, after all. Life is supposed to be physical. Desires, resources and our comfort level with having them occupy our attention under this month’s Taurus New Moon. It’s a volatile, highly charged passage — we are protective of our toys and turf, after all — birthing monumental arrivals and departures, breakdowns, door-openings, manna from heaven (and from long, hard work), personal lines in the sand, and the occasional tantrum toddler-style. Part of the intensity and mindboggling nature of some recent developments is due to the fact that this New Moon is not a free-standing event. It’s in a cluster of terrain-altering activity, the second in the trio of the spring’s eclipses, which are inescapably escalating, intensifying and complicating life no matter which way you turn. This New Moon is a solar eclipse, which means it slams and locks doors while catapulting us long and far in a refocused direction. We come into this solar eclipse armed with real-world knowledge. The Sun and the Moon have just passed over Mercury and Mars, attuning our minds and will (and maybe temper) to the current state of our physicality. Venus, the ruler of Taurus, has left her comfy home and moved into the communication zone of Gemini, a shift that stimulates thinking, conversing and exploring options. We know what we have, what we want and don’t want, what more we need (or think we do), and what is necessary to address all this. Some of this knowledge has come through trial by ordeal. This eclipse has unleashed an epidemic of tools malfunctioning that require repair, updating, tweaking or replacing to get the intended job done. (This eclipse is near the Moon’s South Node, which represents what we are moving away from — hence the releasing and ending overtones of the times. )Glitches and breakdowns are happening that we can’t ignore or postpone. You’re in the middle of a task, required technology fails to perform, and you have to deal with it on the spot to finish the job. Makeshift fixes may work for the moment, but this crop of breakdowns is making it clear that you can not just make do; you must find a lasting solution. No more making do applies to more than objects. This eclipse is stressing all the little shortfalls and irritations and not-quite fitting situations of your life — anything and everything you put up with because that’s easier than confronting it, because you don’t have the time or money, because it seems so minor, because you didn’t previously consciously notice how much it bothered you. Isn’t your bother meter active now? What’s registering on it? Every time you encounter these annoyances, petty or small, even in your peripheral vision, they catch your attention. Especially if you consciously react to and resist them, they nibble at your time, your focus and your energy, all of which are resources. Reframe them as: an energy drain. The idea of zero-tolerance leads to another evolutionary potential of the Taurus solar eclipse: You have the right to not merely desire, but to have desire fulfilled. You have the right to have what you already have. (Think about that: are you ambivalent or perhaps embarrassed by any of your gifts? Your belongings?) You are entitled to have what you want and to have what you have — to receive it, to possess and to enjoy it. This is not to say you should help yourself to anyone else’s stuff, to use Taurean George Carlin’s wonderful term for it. Or that you should let greed take over your life. What is timely, however, is coming to grips with parts of you that are at cross-currents with being here and having stuff. We’re on the earth plane. The material world is where spirit finds form, at least in our perception. The material world is where life happens. It’s where you are. So put at the top of your no-tolerance list any remnant of religious, cultural, race or ethnic guilt or discomfort over (a) being in a physical body, (b) using that physical body and most of all (c) enjoying being in that physical body. Replace it with an entitlement gene. You know that is humanly possible; you’ve certainly known people with one. Implant one in yourself. It will serve you as you proceed through this spring’s wondrous gauntlet of upheaval and change. Know what you value. Know what you have as resources (money, talents, creativity, tools, relationships). Allow yourself to use, to consume and to enjoy them. Know what you need to function effectively. Upgrade your tools and your attitude about your worth and being paid. You are working hard lately — the Moon and the Sun are both coming off a contact to taskmaster Saturn, and schedules and responsibilities are backbreaking as a result — and you need to be paid properly for your efforts. Desire. Resources. Entitlement. Looking at the dramas with those concepts as framework will simplify much in the coming weeks. It may also help to think back to late 1993 – early 1994, when we last made a gear shift from Sagittarius/Gemini eclipses to the Scorpio/Taurus axis. This week’s eclipse occurs at the same place as a solar eclipse on May 10, 1994. think about how all these earthly themes played out then. Some may be coming back around again for rebooting. For a longer discussion of the spring’s eclipses, please read the section headed “The Next Four Weeks” in my 2013 Scorpio Full Moon Lunar Eclipse forecast. Gene Roddenberry’s vision for Star Trek and humanity has endured for nearly 50 years. The reason why is, appropriately, in the stars. Roddenberry’s birth chart contains all the ingredients for the appeal and relevance of his creation. Star Trek’s themes and characters jump right out of the chart. It connects directly to each of the five TV series. It also links to the revolutionary fervor of the 1960s — and of our current times. Five conjunctions in Roddenberry’s chart set up the themes that have defined Star Trek and have evolved and endured. The foundation of the chart and his life is a close conjunction between Jupiter and Saturn in Virgo in the fourth house of home and security. That alone contains the seed of his vision: a logical, orderly philosophy and system of tribal rules and conventions. We are family, but we’re going to be intellectual and well-reasoned about it. It’s a beneficent, nonemotional view of humanity’s potential, to improve, to evolve beyond racism and, to some extent, species-ism, and to exist within healthy, individual intactness and boundaries. Stark, simple and as minimalist as the decor of any private quarters on the starship, the conjunction is the genesis of Spock and the Vulcans, Data, the Q, Voyager’s holographic doctor and the Borg’s drive to perfection. And it encapsulates the prime directive of noninterference with the right of alien civilizations to self-determination. These themes also arise, with different colors, from the Moon/Uranus conjunction in Pisces in the ninth house of life philosophy, foreign cultures and the media. That pairing embodies a visceral, nonrational experience of oneness with a progressive, future-oriented, radical perspective. In this world view, the sea of life teems with quirky, brilliant, weird, alien, emotionally distant, technologically inclined or even outright technologically based individuals and cultures, which are intrinsically connected yet give each other breathing room. Moon/Uranus in Pisces has an instinctive comfort with liberated, self-sufficient and ground-breaking women, as well as ones who connect without words and without possessing. Think Lt. Uhura, played by Nichelle Nichols, the sole black member of a cast of Caucasians (and one Asian), who also — how Uranian — participated in television’s first interracial kiss. Think, too, of Counselor Troi and the Betazoid race of empaths to which she belongs, and the all-knowing listener Guinan, whose powers of perception extend across timelines. Women are capable of a lot more, though, and Moon/Uranus has a collaborator that deepens and darkens the plot. That pair trines the Pluto/Venus conjunction that sits on Roddenberry’s ascendant. Women are powerful, commanding and magnetic; women are survivors; women can bring both life and death. This describes the eerily beautiful queen of the Borg, whose assimilation of captives takes them from autonomous being to part of a collective brain — a Plutonian metamorphosis if there ever were one. The trining conjunctions play out in Star Fleet, too, though that took a while. Decades, to be exact. Roddenberry’s attitude was so forward-thinking that he envisioned a woman at the helm, but the TV execs of the mid-1960s did not agree. (Instead of playing the captain, his wife Majel Barrett appeared in small roles and also supplied — shades of Moon/Uranus — the voice of the computer). Roddenberry did not get his way for 30 years, until Capt. Kathryn Janeway took command of the bridge of Voyager, the fourth series in the franchise. Her character plays out other, somber aspects of the Pluto/Venus potential, too. The first episode of that series cuts her off from her fiance and her beloved dog when the ship is catapulted and stranded 70,000 light years away from its base. But wait! There’s more. (What a rich chart!) The Pluto/Venus conjunction translates directly into blood-thirsty enemies with the power and drive to annihilate, and who come back again and again and again — Klingons (who morphed, how Plutonian, into allies), Romulans, Cardassians and the Borg. The Pluto/Venus conjunction also reveals deeply rooted impulses and values that underlie the rationality of Jupiter/Saturn. Attachment to family, tribe and tradition is laced with the imperative, conscious and otherwise, to transform all of the above — and to bring secrets and unpleasantness to light in the process. This conjunction and all of the characteristics that spin out from it define Roddenberry. His identity involved that compulsion to transform his people, and the conjunction insured that compulsion, and his vision, would renew and remake itself again and again. The aspect outfitted him to interact with enormous power and wealth. And, since the two money planets are involved, it promised wealth for him, too. That money-making potential also appears in Roddenberry’s second-house Mars/Neptune conjunction in Leo. Mars in Leo expresses itself dramatically and flamboyantly; the company of master illusionist Neptune makes that flashiness translate naturally onto the screen. The second house shows what this masterful showman valued: fieriness, grand gestures, claiming center stage, tinging actions with mystery, glamour, magic and a higher, even spiritual perspective. His Sun/Mercury conjunction in Leo, in the third house of communication, continues the expressiveness, the larger-than-life stature, perhaps with a swagger or boastfulness. Sound like Kirk, anyone? Mars and the Sun contain the characteristics of not just a leader, but a commander, the position that is the central character in all the series. (Okay; Deep Space Nine is debatable.) And not just a commander, but a risk-taker, adventurer and explorer of the final frontier, shown by those two conjunctions trining Chiron and the South Node in Aries in the 10th. Roddenberry’s career and public role pivoted on mastering his own independence, impulsiveness, aggression and bravado. (I repeat: sound like Kirk, anyone?) The South Node shows those traits as instinctive behavior and his automatic reaction under pressure. In the 10th, though, they have a public impact. Perhaps this conjunction expresses our heritage of exploration and tempers the passion in a way that keeps it alive and exciting and fits it for ordinary life. Star Trek’s maiden voyage captured the social vision of Roddenberry’s chart. Using the TV series’ premiere date of September 8, 1966 gives the series five planets in Virgo, with Mercury, the Sun, Pluto and Uranus conjunct Roddenberry’s fourth house Jupiter/Saturn (and sextiling his first house Venus). Communicating that vision was the show’s very mission, which was also bound up with astrological signature of the times. Uranus and Pluto were conjunct from 1965-68, birthing the revolutionary atmosphere we associate with the late 60s: flower power, psychedelic rock and drugs, violence in the streets, assassinations, political and anti-war protests, sits in and other blows against the establishment. Star Trek spoke to the times and modeled an alternative, neater, cleaner, calmer, more evolved path for humans. Kirk took center stage playing out Roddenberry’s Leo and Aries conjunctions with unapologetic, over-the-top fervor. Spock and Dr. McCoy offered two expressions of Jupiter/Saturn in Virgo, one the embodiment of reason, the other the big-hearted healer. (McCoy indulged in his share of histrionics, too.) The international — nay, intergalatic — crew embodied Moon/Uranus in the ninth. The show’s Saturn/Chiron conjunction in Pisces, falling in Roddenberry’s 10th house, presaged initial obstacles (the show ran for only years) but ultimately staying power in the public consciousness. What sealed that staying power, though, was the Uranus/Pluto signature of the late 60s locking in with Roddenberry’s Jupiter/Saturn vision. The vibe of the time fused with Star Trek’s vision of the future and insured it would return and reinvent itself again and again and again. While the first series implanted Roddenberry’s vision into our consciousness, the second took the vision and catapulted it to bold new horizons. Action planet Mars was on that defining Jupiter/Saturn conjunction (and directly atop Saturn) when Star Trek: The Next Generation (TNG) premiered on September 28, 1987. Driving and perfecting that vision was TNG’s mission — and with this earth sign Mars, TNG proved to be the longest running of the series, lasting seven years. Its Pluto trines Roddenberry’s Uranus, unleashing a powerful (and addictive) flow for his futuristic vision. Carrying that vision to the screen and, paradoxically, making it concrete is the planet that sits between them, Neptune in Capricorn on the cusp of his seventh house of partners. TNG’s core was a stellium in Sagittarius of Saturn, Moon and Uranus — respect and adherence to laws, diversity and exploration — falling in Roddenberry’s sixth house of service and making an adjustment aspect to his Venus. The adjustments were many, and most proved ultimately more than palatable to audiences. What was adjusted? Kirk’s impulsiveness and hotheadedness gave way to a calm, wise, stentorian commander (played, appropriately for that Pluto/Venus, by Cancerian Patrick Stewart). This captain works with a fiery Number One, Mr. Riker (played by Jonathan Frakes, a late Leo like Roddenberry), who in the early seasons carried on Kirk’s tradition of womanizing. Mr. Spock’s Vulcan logic, which had counterbalanced the outbursts of Kirk and McCoy, now took the form of an android, Commander Data (played by Aquarian Brent Spiner.) Klingons evolved to such Federation allies that Worf served as the ship’s security officer (played by Michael Dorn, whose Sagittarius Sun conjoins the show’s stellium). 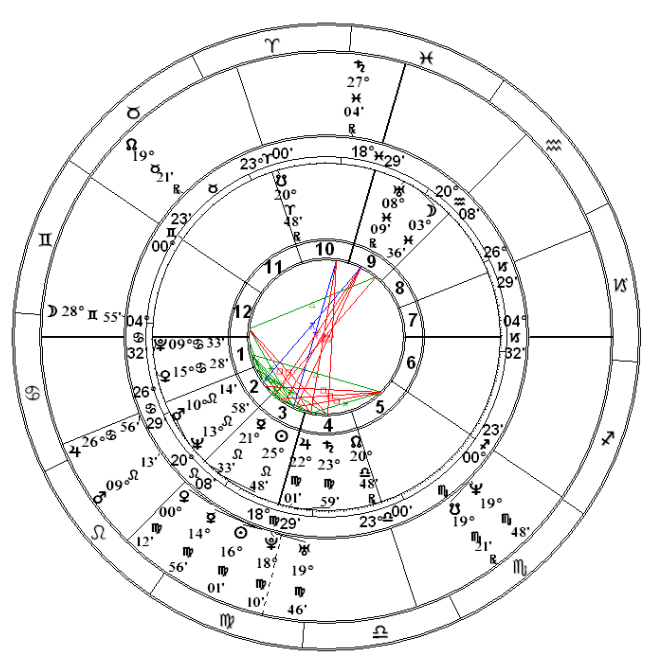 The casts’ links to Roddenberry’s chart is surely part of the show’s success, and it carries through to the actresses: Marina Sirtis as empath Deanna Troi, whose early degree Aries Sun trines Roddenberry’s Mars, and Gates McFadden as the ship’s doctor, a late degree Pisces whose Suns oppose the defining Jupiter/Saturn conjunction. Scorpio Whoopi Goldberg expressing the Plutonian tint to that Cancerian Venus; late-degree Leo Diana Muldaur briefly portrayed the less than popular Dr. Pulaski. The woman were not merely mouthpieces for Roddenberry, but also part of the show’s enormous appeal to the masses. Note TNG’s Venus (sextile that lovely Sag stellium) moving toward a conjunction with Roddenberry’s north node. No wonder TNG was the highest rated of all the Star Trek series. 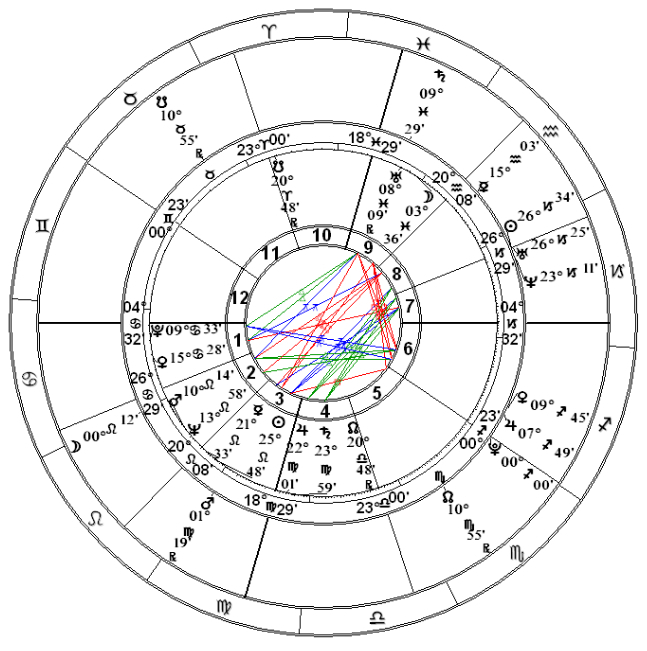 Deep Space Nine, premiering on January 3, 1993, also has a close Mars contact to Roddenberry’s chart — and the nature of this defines the difference between this show and its predecessors. DS9 had Mars in Cancer near the midpoint of Roddenberry’s Pluto/Venus conjunction. The show’s mission, drive and agenda were in the sign of home, advancing themes of tribal connections, loss, desire and wealth. Like the previous two shows, this one had its own tight but distinctive link to Roddenberry’s Jupiter/Saturn vision. 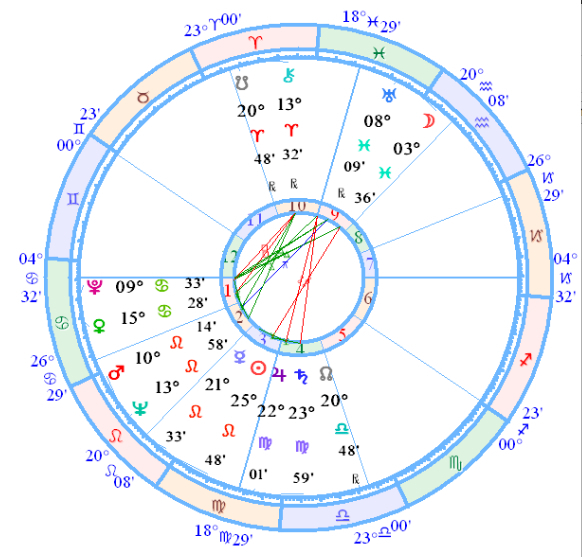 DS9 has progressive Uranus conjunct illusionist Neptune in Capricorn, trining that Jupiter/Saturn signature and falling in Roddenberry’s partnership house. It carried on his vision with a slant, adding its own quirks and twists, such as the science officer Jadzia, a female Trill who is joined symbiotically with a long-lived being called Dax. DS9 didn’t bring the archetypes of Roddenberry’s chart to life in the way that the first two shows do. Two of the main cast members do have links to Roddenberry’s chart. Avery Brooks, portraying Commanding Officer Benjamin Sisko, is a Libra whose Sun conjoins Roddenberry’s North Node. First Officer Kira Nery is played by Nana Visitor, whose Leo Sun conjoins Roddenberry’s Mars. Many of the other major recurring actors, however, lack this commonality, which is, again, fitting for how far afield this show went from Roddenberry’s concept. Still, DS9 proved to be the second-longest of the series, lasting six and a half years — a testimony to that close Mars contact. The fourth series in the Star Trek franchise fulfilled one aspect of Roddenberry’s vision while taking the concept into vastly different territory. His concept for a female captain found form at last three and a half years after his death, when Voyager premiered on January 16, 1995. At least four aspects between the charts explain why his wish came true then. One is the conjunction between the show’s Saturn and Roddenberry’s Uranus, a link that spells placing a structure on a radical innovation. Others involve the show’s Venus in Sagittarius. Not only is it inconjunct Roddenberry’s Venus, an aspect requiring an adjustment, it also squares his Uranus, an aspect that demands action. Interestingly, these two aspects are repeated in the synastry with actress Kate Mulgrew, who portrayed Capt. Janeway. Her 7 degree Taurus Sun is inconjunct Voyager’s Pluto/Jupiter/Venus stellium in Sagittarius, and squares Roddenberry’s Mars in Leo. Her Sun also sextiles the signatures for Roddenberry’s experience of women, that first house Pluto/Venus conjunction and ninth house Moon/Uranus conjunction Astrologically, the time was right, and so was her casting. 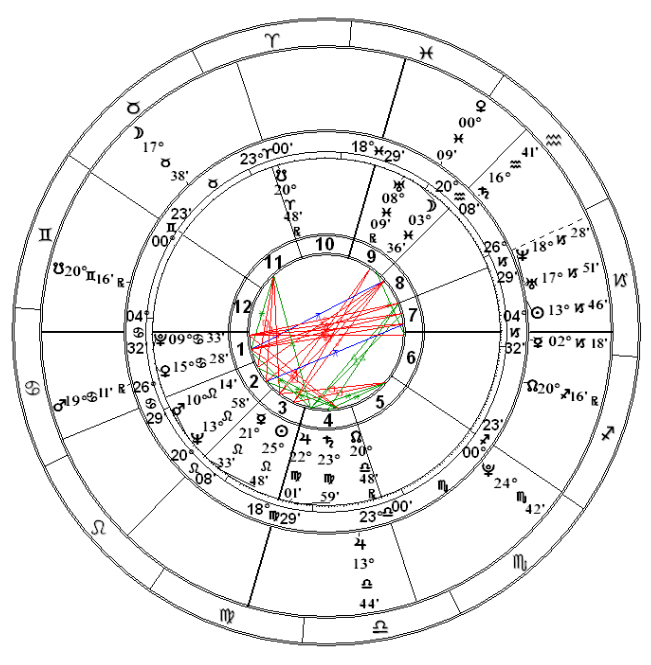 Just as important is the contact Voyager’s chart makes to Roddenberry’s Jupiter/Saturn conjunction, trining it with a Capricorn Neptune/Uranus/Sun stellium. With the Sun participating in this aspect, Voyager’s very purpose was bringing a new interpretation (Uranus) of the vision to the screen (Neptune). Part of that newness was technological; Voyager was the first Star Trek series to use computer-generated imagery instead of models for exterior shots. Like DS9, Voyager explored the darker possibilities of our future in space. This show embraced them (and Roddenberry’s Pluto/Venus) from the first episode, with a freak energy wave (Uranus in Pisces, anyone?) propelling the ship impossibly far from home. The show also reversed the role of logical, technological beings, in a twist on the previous expression of Roddenberry’s Moon/Uranus conjunction. During Voyager’s six years on the air, two Uranian characters evolved into a more human, emotional and creative experience of life: the ship’s holographic doctor, who discovered the joys of music, and the liberated Borg drone Seven of Nine. The final series in the TV franchise took the motto “To boldly go where no man has gone before” and ran with it. Premiering on September 26, 2001, Enterprise (the “Star Trek” and colon were added after the second season) sent humans further into space than ever before, and pitted them against an enemy, the Xindi, determined to annihilate them. 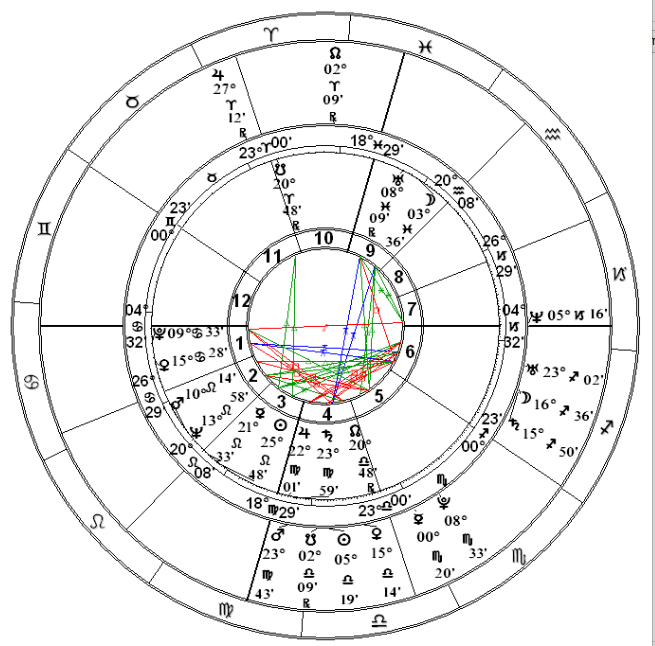 That last aspect smacks of Roddenberry’s Pluto/Venus conjunction, and no surprise that the show’s one major contact to his chart is Jupiter conjunct exactly that. The Sun of the lead actor (Scott Bakula, playing Jonathan Archer) does conjoin Roddenberry’s Libra North Node, but otherwise Enterprise lacks the network of aspects that led to the other shows so effectively playing out the creator’s personal inner dynamics. 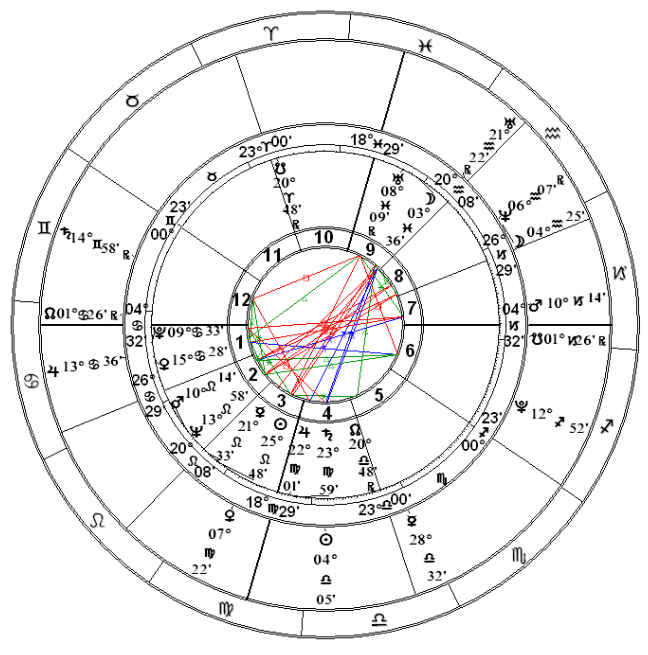 Enterprise’s relationship to Roddenberry’s Jupiter/Saturn conjunction, which every other show dramatically expressed, is distant at best: Saturn in Gemini, falling in his 12th house of self-undoing, squares the definitive conjunction with a seven-degree orb. What a formula for a damper. No surprise that Enterprise did not pull in the ratings and ended up, like the first series, being cancelled in production. The end of new TV series has not dimmed the appeal of Roddenberry’s vision. It is still very much relevant to our current turbulent times, and so is the first series’ interpretation of it. Uranus and Pluto have moved from the conjunction that defined the late 60s (and bound the show to Roddenberry’s view) to the testing and birthing imperative of their current square, which is playing out from 2012-2015. The possibilities of evolution and revolution, imprinted with clean, orderly, mankind-perfecting logic by Roddenberry’s Jupiter/Saturn, are now messy, terrifying, and destructive, ripping apart the foundations of our lives, institutions and systems and opening us to radically different ways of being. How remarkable and astrologically appropriate that the film being released in the midst of this upheaval bears the title Star Trek Into Darkness (release date: May 16, 2013) — and involves internal terror and a weapon of mass destruction. Transits to Roddenberry’s chart show that all is not lost; Hope does exist within Pandora’s Box. The cosmic illusionist and the healer, Neptune and Chiron, are currently traveling over Roddenberry’s Moon/Uranus conjunction. Wounds and illusion of separation are finding healing. Other ways are becoming possible of relating, of connecting, of sharing emotions and nurturing, of being together without being enmeshed, of coexisting with the feminine. We are not alone, perhaps not even in the galaxy, a possibility that citizen-prompted hearings are currently exploring — and would it really be a coincidence if evidence of that were to come forward while Roddenberry’s Moon/Uranus are being activated? It would be another dream come true for him.